Wine is a drink made from fermented grapes that has been popular for centuries. It is only in the recent past, perhaps the last several decades, where wine has gone from an ok-tasting (and sometimes quite bad) alcoholic beverage to something of an art form. A great bottle of wine, much like a great olive oil, has lots of complex flavors and goes down smoothly enough that you want a little bit more. 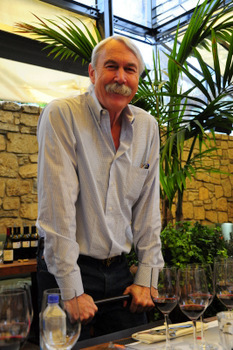 I had the chance to take a sneak peak into the world of wine making recently at a wine blending seminar hosted by Kendall Jackson’s Winemaster Randy Ullom and overseer of the making of all of the Kendall Jackson family wines. If you think that is a lot of wines to oversee the creation of – you are absolutely right, and while the job sounds amazing I can tell you from trying to blend one glass of wine that it isn’t quite as easy as you might think! 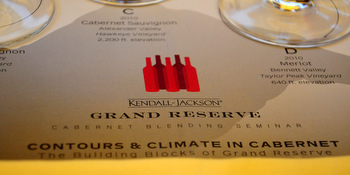 The seminar was focused on how wine is blended and centered on Kendall Jackson’s Grand Reserve Cabernet Sauvignon, one of their signature wines. 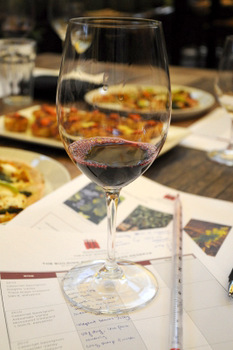 The wine is produced from 100% Kendall Jackson estate grown grapes, which means that the winemaker is able to track some of the unique flavors that different vineyards give to their grapes over the years (a.k.a. terrior) and use those profiles to create the finished wine. Very high end wines might focus on a single vineyard or even a single portion of a vineyard, which really highlights specific terrior. 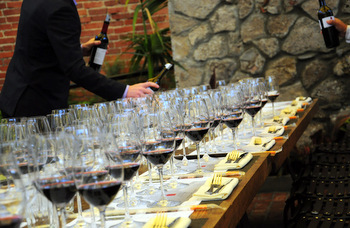 There are five different grapes from five different vineyards that went into the 2009 Grand Reserve Cabernet Sauvignon. This was a unique seminar because Randy brought samples of each of the components of the finished wine – all separate – and we were able to taste them individually and then try to blend them together to create our version of theÂ Grand Reserve Cabernet Sauvignon. 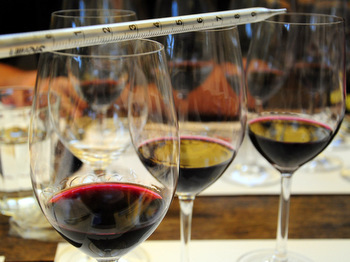 First, we took extensive notes about the three Cabernet samples – all from different elevations – and the two other grapes, a Merlot and a Petit Verdot. Some were more fruity, some more minerally. The unblended wines tasted very different, even those made with the same grapes, and tasting them really gave everyone an idea of how many different finished products you could make with the same starting components (just like baking!). 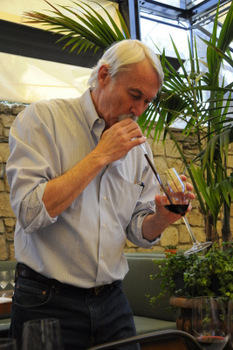 Once we tasted all the wines, Randy demonstrated how to use a pipette and blend a few mililiters at a time from some or all of our samples to build our finished cabernet. 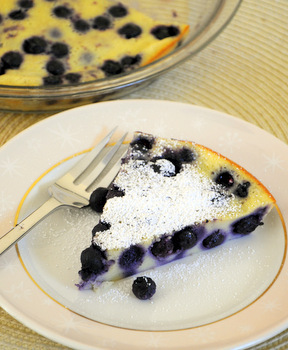 We had to use primarily cabernet, but since this was just for fun we did have free rein to try to create our own concoction if we thought it would be a good one. Randy went around and tasted everyone’s creations, all 20 or so of them from other bloggers, chefs and restaurateurs, and weighed in on our future careers as winemakers. 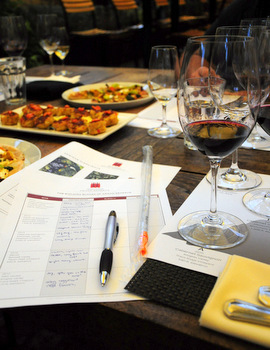 Wine tasting is subjective – we all have our own preferences Â – but when you taste blends in a situation like this, you can appreciate how much a professional taster does. Mine ended up being a little bolder than the cabernet we were trying to match, but still drinkable. 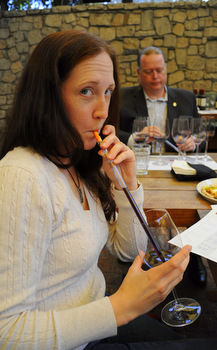 Others fared even better, getting quite close to the KJ wine. 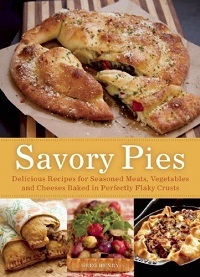 Others fared worse, showing that shifting the ratio of the components by a few percentage points had a big impact on flavor. I was a bit disappointed that my next career probably will not be as a wine maker, but I still had an amazing experience and enjoyed the wine even more after seeing how it was built. At the end of the day, we were able to pair our wines – and Randy’s – with some snacks from Sadie, the Hollywood restaurant that hosted us all for the event. 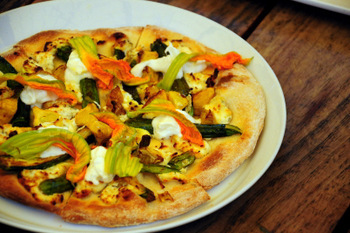 The cabernet goes well with squash blossom pizza, steak, lamb and a few other foods, in case you’re wondering! Are they seriously mouth-pipetting? why? Katie – Yes, we were. 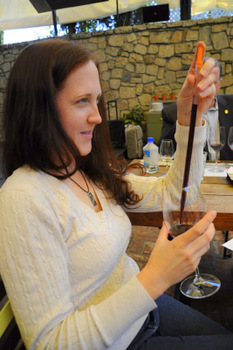 It was a quick and easy way for us to blend small amounts of our sample wines (think 10-20 mls). I imagine that in the lab where more “official” testing goes on, they might utilize some different techniques.